Every blood donor who visits our Blood Donor Center has a unique story, and many have a reason or inspiration that has sparked a desire to become a donor. Dale’s reason is simply an altruistic one—a way to help the community. Dale enjoys donating, and he promotes this life-saving act every chance he gets. Dale first began his blood-donation journey in the early 1980s. IBM, his place of employment, advocates for blood donation and encourages its employees to give back to the community. A department blood drive started Dale on his journey, and he has been a faithful donor since that time. After a time, Dale felt that he wanted to give more, so he set a new goal—one gallon each year, which meant he would have to donate more than the six times per year. Platelet donation was the answer for Dale, and it helped him meet his new goal, and more. Dale now donates platelets every time, and he earns a three-gallon pin each year. 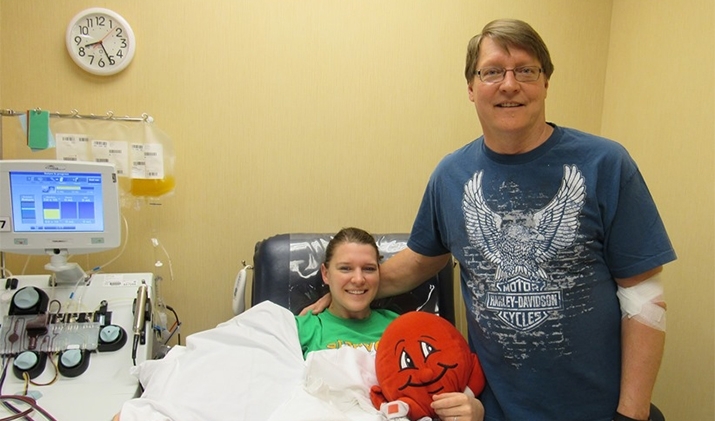 Dale recently encouraged one of his daughters, Chelsey, to give platelet donation a try. The appointment was strategically planned so that Dale gave his 240th donation and received his 30-gallon pin at the same time that Chelsey gave her 8th donation and earned her 1-gallon pin. A lot of blood products have been donated from this one family! 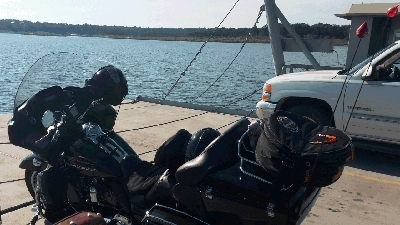 Notice the blood drops on Dale's motorcycle antennas on the back of his bike? Besides blood donation, Dale’s passions in life include spending time with his family, riding his Harley Davidson with his wife (the motorcycle even has blood drops on the antennas), and watching NDSU football. Thank you, Dale, for being one of our dedicated blood donors and for sharing so much of your time with us. When you give, others live. @barbarajpa Great story. I used to give blood very regularly, 6 times a year but then I moved and the new center just didn’t seem able to successful in drawing my blood so I stopped. I wonder if at my age I can still donate blood, I will look into that.